(a) At an air show a jet flies directly toward the stands at a speed of 1200 km/h, emitting a frequency of 3500 Hz, on a day when the speed of sound is 342 m/s. What frequency is received by the observers? (b) What frequency do they receive as the plane flies directly away from them? This is College Physics Answers with Shaun Dychko. At an airshow, a jet is flying towards observers that are sitting in the stands, flying out of the speed of 1200 kilometers per hour, which we convert into meters per second because all of our formulas require m k s units, meters, kilograms, and seconds. And so, we'll multiply by one hour for every 3600 seconds and then multiply it by 1000 meters per kilometer, leaving us with units of meters per second. That gives out to a 333.33 meters per second. The frequency observed by the pilot who is not moving with respect to the plane is 3500 hertz, and the speed of sound we're told on this day is 342 meters per second. 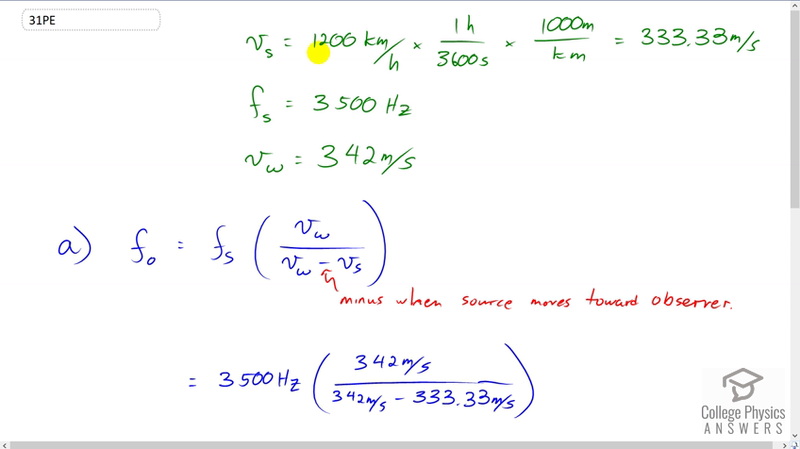 So, we have this formula for the doppler shifted frequency in terms of the source frequency that's originally admitted, and it's going to be the source frequency times the speed of sound divided by the speed of sound minus the speed of the source. And, there's a minus when the source moves towards the observer. And, in the textbook, you have Fo for observer equals Fs times Vw over Vw minus or plus Vs. And it could be confusing to know when should you use a minus or a plus, Well, I keep in mind what actually happens when you observe something coming towards you, and it's not hard for me to memorize that it gets higher frequency as it approaches, and a lower frequency as it, after it goes by. If you ever watch formula one racing on TV, you always here a zoom sound when a car goes by, and it's lower when it's going away, and higher when it's coming towards. So, you need to choose the sign here that causes this fraction to be bigger. By having a smaller denominator, you make the fraction bigger. And so, that means a minus if the source is moving towards the observer. Okay. So, we have 3500 hertz times the speed of sound divided by the speed of sound minus the speed of the plane, and this makes 138 kilohertz. That's what will be observed as the frequency according to somebody sitting in the stands. And then, after the plane passes and it's going away from the people in the stands, we use a plus sign here, otherwise it's the same formula. And this perks out to 1770 hertz, which is a lower frequency than the source frequency, as we expect.